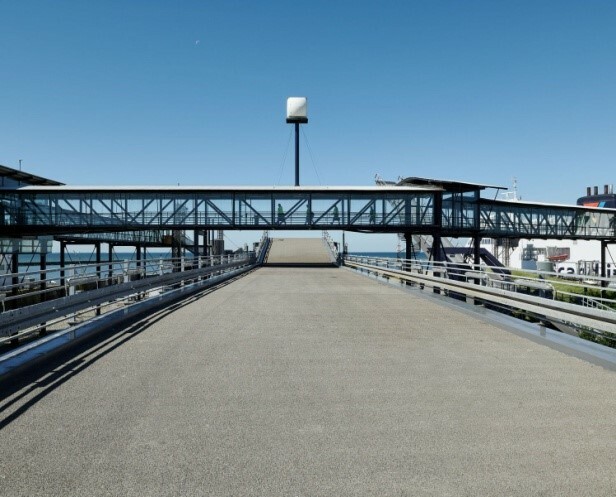 Scandlines firstly enquired for a turnkey solution for the use of Bimagrip anti-skid surfacing to be applied at the Port of Rodby. Thortech Bridges & Marine’s flew straight out to visit Scandlines in Rodby, Denmark to carry out a full site survey/inspection. Our quotation was then approved for works to be carried out over two phases. 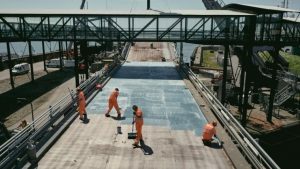 The instruction was to remove the existing surface, then supply and lay Beegrip’s Bimagrip LS anti-skid surfacing to Berth 2. 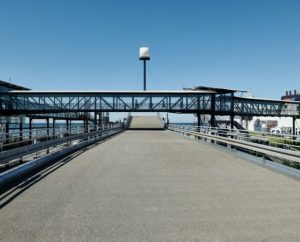 The Port of Rodby predominantly allows ferry crossings between Rodby, Denmark and Puttgarden, Germany, currently the Port has four berths allowing ferries to travel to and from Rodby every 30mins. Being in almost constant use the Linkspans a robust anti-skid surfacing that can deal with the large amounts of traffic it receives. Beegrip’s Bimagrip LS Resin System was the ideal product to cope. 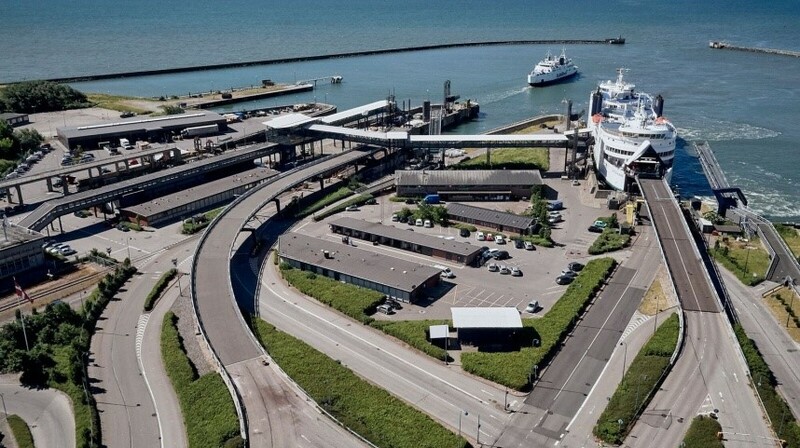 To ensure we had full access to the Linkspan; Scandlines started by closing off Berth 2 redirecting any ferries to an alternative Berth whilst work was completed. We started by marking out application areas for each day, with an aim to lay a minimum of approximately 250sqm a day. First was the preparation work, we preheated the existing anti-skid surfacing by road dryer and began removing the surfacing by bobcat with scaper attachment. Once all was removed, we prepared the steel substrate by enclosed shot blasting ensuring the surface was to Swedish Standard SA2.5, all edges were completed by the hand-held grinder. Once the steel substrate was correctly prepared, we applied Acraprime by roller to the exposed deck. After the Acraprime had fully cured we began applying our Bimagrip LS, mixing components and spreading resin by squeegee at 5.5kg/sqm. Emery Bauxite (3-5mm) was then scattered over the area ensuring all surface area was covered. The excess aggregate was then swept away by Road Sweeper and put to one side ready for the next day’s application. With a bit of luck, the weather was on our side throughout the application works. 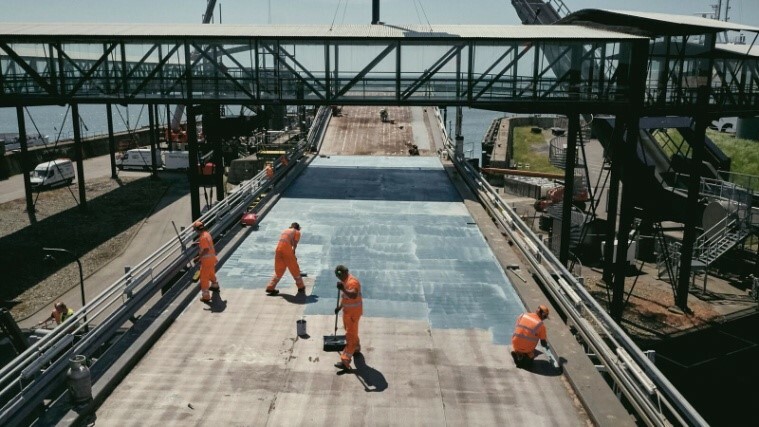 Thortech Bridges & Marine successfully completed all the works on the project as requested in 7 days and comfortably within the timescales set out by Scandlines, enabling them to reopen Berth 2 as planned.